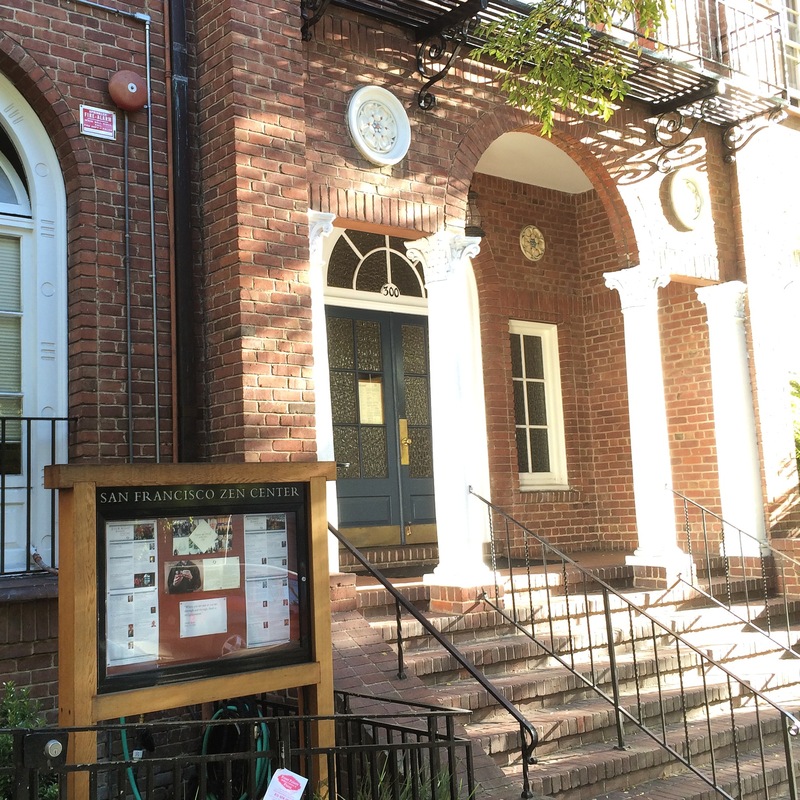 Another early day began at 8:30 in the morning, arriving at the San Francisco Zen Center. Saturdays are community days at this Sangha, one of the largest ouside of Asia. This center, in the Soto Zen tradition, was established in 1962 by Shunryu Suzuki Roshi and his American students. Some eighty residents live, work and practice in this place. Zazen training for beginners happens every Saturday at 8:40 and it’s taught by one of the priests. I was surprised to see such a large group gathered so early on a Saturday morning to learn the basics of sitting meditation. For over an hour we were taught several sitting postures as well as the principles of meditation. In the end, we got to sit zazen for a short period of ten minutes. It is also on Saturdays that dharma talks are given. These talks are also available to the community as well as broadcasted via the web. Following zazen instruction, the room was rearranged for the talk. Before long, people started to arrive and the room was soon at capacity. Today’s talk was given by Kiku Christina Lehnherr, a senior dharma teacher and former abbess of the Center. I’m so grateful to have heard this teaching in person and you can watch it here (there were some technical difficulties, skip to minute 4:00 for the beginning of the talk). The Buddha Room, where the dharma talk was given. My day at the SFZC was only halfway through and it had already been a wonderful time. There was a break of about fifteen minutes following the talk during which people mingled throughout the center with cookies and tea. This is a very vibrant community with everything from first time visitors to seasoned masters. It was lovely being in their midst. It was time for forms training and I was very eager for this particular class. My experience with zen is very limited and this class walked us through the particular forms for entering and sitting in the zendo. 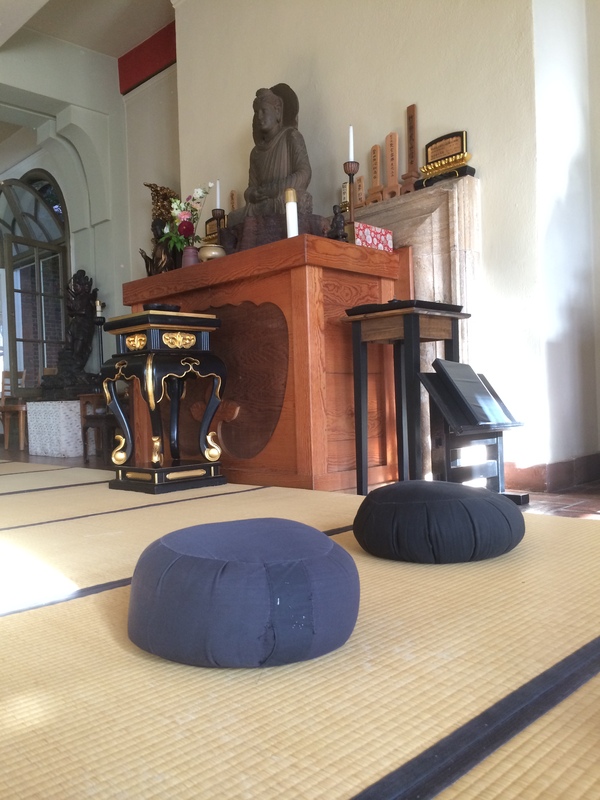 The zendo is the meditation hall where zen practitioners sit for extended periods of group meditation. There are specific ways of entering the room, finding your place and sitting. There are clear reasons for these prescribed behaviors in the zendo, as our teacher explained, and they all have to do with an intentional and mindful approach to the practice. There is no penalty for entering the zendo with your right foot instead of your left, as is the form. Rather, one should act accordingly as part of the practice. Every aspect of zen practice is carefully undertaken in an effort to be as present and mindful as one can possibly be. After forms training, we were all invited to stay for lunch, and I’m so glad I did. It was during communal lunch that I got to visit with new and experience buddhists from all over the country and the world. People come to the SFZC from all over. They live and work here, and they practice together, every day from before sunrise until dark. There is plenty of work to be done, in the kitchen, around the facilities, and at Green Gulch farm which is about an hour away from the center. Some students stay for a week and others have been living there for years. Enguetsu, a practitioner from Brazil, is here for her second stay. I learn about her journey to Zen and her work at the center; and I learn the meaning of her dharma name: En (empty) Guetsu (moon). We visit for a while and then it’s time to move on. This is one of those (many) times when I wish I’d found Buddhism at an earlier age. I would have loved to have been a resident at a place like this. I headed for North Beach in the afternoon, where I visited the Nuova Porziuncola in the National Shrine of Saint Francis of Assisi. The Nuova Porziuncola is a scale replica of the Porziuncola in Assisi. 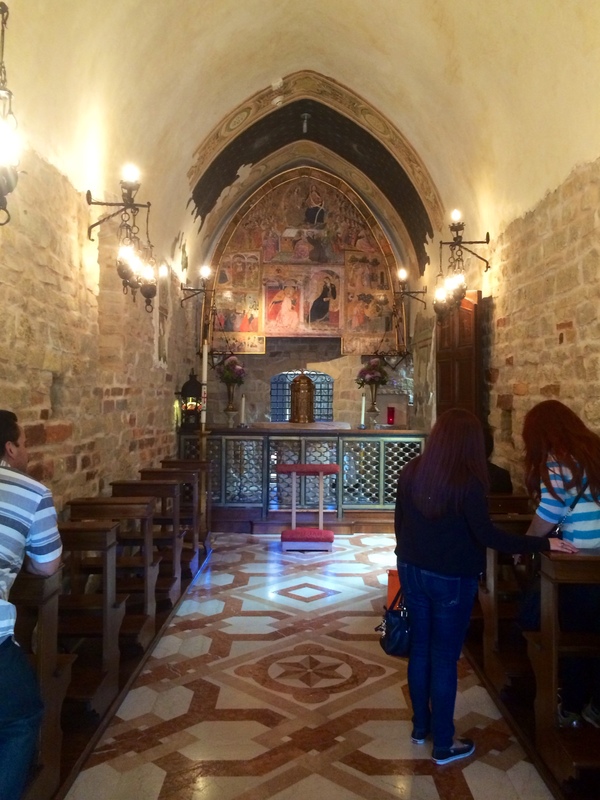 This is the church Saint Francis rebuilt after hearing God’s voice before the crucifix of San Damiano. The Nuova Porziuncola is a work of art and a sacred space. Every day people visit and stay to pray and reflect. I wouldn’t have known to visit had it not been for the kind lady at the St. Mary’s Cathedral bookshop. She insisted I should visit the Porziuncola, and I’m so happy I did. The Nuova Porziuncola was built with exacting standards. 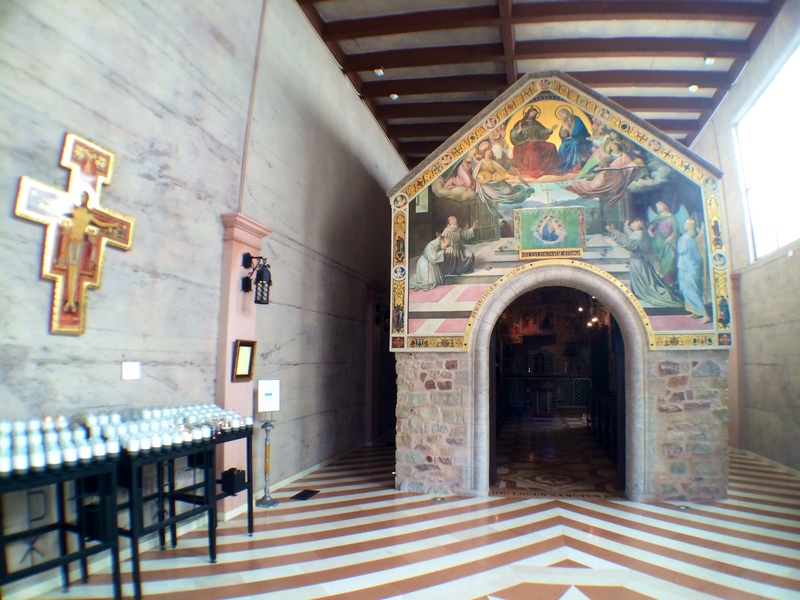 The stones are from the same area in Assisi as those of the original, the marble floors are reclaimed from a church in Assisi, and the frescoes are exact replicas, too. I knelt inside the Porziuncola, admiring the simplicity and beauty of its design. I wondered, if it is possible to feel such a sense of peace and wonder in this replica, what must it be like to visit the original in Assisi? Visitors praying at the Porziuncola.